This spring I taught an introductory Asian American Literature class for the first time (the proper title for the course was "Asian Americans in Literature and Popular Culture"). To my knowledge, this is the first time a course with this title has been taught at Lehigh University. Below I am posting an overview of the course with some commentary added here and there. John Okada, No-No Boy (1956; not published until 1971. Get the 2014 edition.). From the above list, I was pleased with my students' response to books like No-No Boy and American Born Chinese. Native Speaker was a bit of a challenge for them (one student complained that she didn't understand what was happening in the plot), though I do think in our class discussions that we got to the core of this strange but still very powerful novel. But the standout winners from the syllabus were Eddie Huang's memoir along with Eric Liu's The Accidental Asian. I'm contemplating writing a longer piece about their respective concepts of "whiteness," perhaps for an academic journal, later this summer. I should also acknowledge some significant omissions. Other Asian American Lit. syllabi I consulted as I was putting the readings together last fall typically include books like The Woman Warrior by Maxine Hong Kingston. Here I tend to side with Frank Chin, who leveled a pretty devastating critique of Kingston in an influential rant called "Come All Ye Asian American Writers of the Real and the Fake." For related reasons, I nixed Amy Tan from the syllabus as well as my own personal pet peeves from the Indian American side, Bharati Mukherjee and Meena Alexander. I also opted not to try and do Theresa Hak Kyung Cha's Dictee, though it's widely popular in Asian American Lit. syllabi, mainly because I worried it might simply be too difficult and abstract for students in this intro-level course to follow. Ronald Takaki, excerpt chapters from A Different Mirror: A History of Multicultural America. These chapters helped provide a glimpse of the early history for Chinese and Japanese American immigrants, beginning in the 19th century and continuing through the World War II period. Susan Koshy, “The Fiction of Asian American Literature” This essay looks closely at the ‘ethnocentrism’ of Asian American studies in its earlier phase. If the field was earlier dominated by Chinese American and Japanese American scholars, is it possible that our understanding of “Asian American” identity as it has emerged has been skewed? Are we sure that South Asian Americans and Southeast Asian Americans fit under the same umbrella as east Asians? Robert G. Lee, from the book Orientals. We looked at a chapter on the Model Minority myth, and a close reading of the film Sayonara. I didn't assign anything by Indian American historians like Vijay Prashad or Vinay Lal, but I easily could very well have done that. One of my students is currently writing a final project on the Model Minority myth, and I've asked her to look at some chapters of The Karma of Brown Folk that deal with that subject. I thought by underlining the popular culture component of the class that I would draw more students and make the course more fun and lively. The first assumption turned out not to be true -- I only had five students enrolled in the course this go round -- but the second did play out as expected (the course was fun for me to teach, though we'll see in a few weeks whether my students thought so as well). Certainly the fact that this spring we saw the debut and first season of the ABC sitcom Fresh off the Boat gave our discussions of that show (in connection with Eddie Huang's memoir) a special currency. I should also add that I have been working on a book on the filmmaker Mira Nair for a long time, and our discussions of two of her films gave me an opportunity to talk about something I have thought about a lot in terms of research -- but rarely taught. TV: We spent a fair amount of time talking about Eddie Huang’s memoir in connection with the new ABC TV show, Fresh off the Boat. We also looked at a couple of episodes of The Mindy Project, and talked about the controversy over her main character's choice of love interests (all white men) in the first season. We talked about about the growing profile of Asian American actors in Hollywood films and on TV, especially for roles and screenplays written by non-Asians for mainstream audiences. We discussed the ongoing careers of Asian American actors like John Cho (from “Harold” in Harold and Kumar to “Sulu” in the new Star Trek movies), Kal Penn, Archie Panjabi (The Good Wife), Aziz Ansari (Parks and Recreation), and a number of others. In connection with our reading of The Namesake, I asked students to think about Kal Penn's own use of a pseudonym in his career in Hollywood. While there’s been quite a bit of progress from the early days of Charlie Chan, I also suggested to my students that Hollywood still produces occasional racial / ethnic caricatures that we need to think about and be able to critique. Along these lines, a new Netflix show called The Unbreakable Kimmy Schmidt is the latest show to provoke a controversy over the portrayal of an Asian character. In the old days we had examples like the character “Long Duck Dong” in the film Sixteen Candles, and a whole history of Orientalist caricatures of Asian people in early Hollywood (from the 1930s through the 1970s). Today the caricatures, when we see them, are a bit more subtle. We also struggled a bit with Margaret Cho -- someone who is a personal hero to me and many other Asian Americans of my generation -- in large part because her stand up is simply so sexually explicit and raunchy. But we did at least touch on the "weirdness" of the way she handles Asian accents, especially the character of her mother that played such an important role in her early comedy. Film: We looked at early Hollywood representation of Asians in some excerpts from Charlie Chan movies on Youtube. We also looked at the post-World War II film Sayonara (which goes well with John Okada's No-No Boy). We also had dedicated sessions on Justin Lin's Better Luck Tomorrow, Mira Nair's Mississippi Masala, Mira Nair's The Reluctant Fundamentalist, and finally, Clint Eastwood's Gran Torino. On the opening day I presented to my students a series of general questions that I hoped the course as a whole would be able to explore. Here are those questions in brief. 1--How are Asian Americans defined vis a vis other ethnic and racial communities in the United States? What is the distinction we need to make between “race” and “ethnicity”? Is being Asian (in America) a “racial” identity? How does the concept of race work for immigrant communities (like Asians and Hispanics), in comparison to the concept of race in the African American community? Can race and ethnicity categories change (i.e., many people might casually see Asians as effectively “white” in American society)? Given the large number of cross-cultural marriages and bicultural/biracial people who have some Asian ancestry, what happens to Asian identity in the context of increasingly complex, multicultural family dynamics? While these are the ‘standard’ usages of the terms, I think it’s immediately clear that there’s some slipperiness and overlap between the terms that can give rise to a certain confusion. For instance, would “Chinese-American” be a racial or an ethnic category, or both? Also, how significant do we think these the “physical characteristics” really are? What do they actually signify about a person, if anything? Aren’t the cultural factors where real (meaningful) differences between us might be found? Why then does race seem to remain so important in American life? It might also be worth mentioning that a key difference between race and ethnicity in practice might be that the idea of race, because it is founded on (superficial) biological traits, seems permanent, while ethnicity might be malleable. It may be that ethnic identification runs quite strong amongst first generation immigrants (Chinese immigrants who still speak fluent Chinese; Italian immigrants who speak fluent Italian), but doesn’t that begin to shift in the second and third generations? 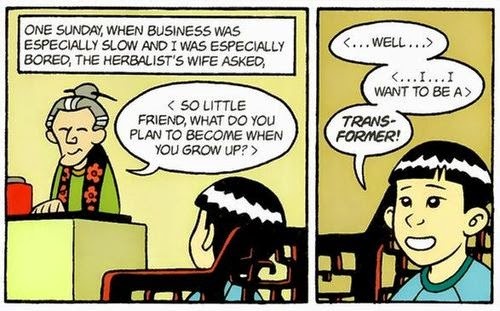 That’s the meaning that I see in the cartoon from Gene Yang above: as a second generation Chinese American, the boy (he is the protagonist of a book-length graphic novel we will be reading later -- American Born Chinese) is interested in self-transformation and self-invention. He doesn’t want to be Chinese like his parents and grandparents; he wants to reinvent himself as an American boy and distance himself from “Chineseness.” On the surface he’s referring to actual “Transformers” (as in, the toys, television cartoons [in the 1980s] etc. ), but unconsciously he is actually thinking of his own ethnic identity. This desire to become something else is problematic -- but still important to think about. 2--Does “Asian American” make sense as a category, given the real cultural, linguistic, religious, and even complexional differences amongst different Asian communities? When people use the word “Asian” in casual conversation, are they really referring to people from Eastern Asian countries (Korea, China, Japan), not South Asians (India, Pakistan, Bangladesh)? [A friend of mine, Manish Vij, felt so passionately about this issue some years ago that he even started a website devoted to the topic: indiansareasian.com!] And what about Southeast Asian countries (Indonesia, Malaysia, Singapore, the Philippines, Vietnam, Thailand, Cambodia, Laos…)? On the other hand, perhaps there are commonalities in our experiences as immigrants and children of immigrants that might lead us to find value in even a pretty loose concept of Asian American identity. If so, what are those commonalities? ● In the American vernacular, "Asian" usually refers to someone of East or Southeast Asian descent. ● In the British vernacular, "Asian" usually refers to someone of South Asian descent. ● The U.S. government categorizes peoples of East Asian, Southeast Asian, and South Asian descent as "Asian". ● The U.S. government categorizes peoples of Central Asian or West Asian (Middle Eastern) descent as "white". ● Historically, Indian Americans have been classified as white, "Hindoo", "Other", and currently, Asian American. On the first point, the thing to probably keep in mind is that the common (vernacular) usage of a term doesn’t have to line up with a more academic or sociologically precise usage of a term. Just because most people use the word a certain way doesn’t mean we have to. Two of the country’s fifty state governors as Indian Americans – interestingly, both of them are Republicans (though most Asian Americans are democrats), elected in southern states (Louisiana’s Bobby Jindal and South Carolina’s Nikki Haley). Is their election significant? What role do Asian American elected officials play, both within Asian American communities, and more broadly? Does it matter how many elected Asian American officials there are? Why do Asian communities tend to skew Democratic? 5--Are Asian Americans at the present moment still a minority deserving of privileges and accommodations along the lines of those that are given to “underrepresented” minorities like African Americans and Hispanics? Or does the fact that many (though definitely not all) Asians come from economically privileged backgrounds mean that Asian Americans need to be understood as a “non-oppressed” minority? Can one be in a relatively privileged social and economic status within American life and still be on the receiving end of racism? A growing number of Asians identify as white or effectively white. (One prominent person who identified at one point as white is South Carolina Governor Nikki Haley; in a census some years ago she marked herself as white. Both of her parents are ethnically Indian.) Under what circumstances might we come to understand Asians as white (or at least effectively white)? Polls show Asian-Americans divided fairly evenly on the use of affirmative action. I would encourage you all to read that entire New York Times article I linked to above at some point. 6--How is the role of Asian Americans in contemporary popular culture changing? How are Asian American writers, actors, and other performers bringing the complex and diverse cultural stories of our various traditions into the American mainstream? What might be the significance of the popular rap / EDM group the Far East Movement? Does the fact that ABC has a new show about a Taiwanese-American family called Fresh Off the Boat suggest that Asian culture is now mainstream? Have we made progress in the twenty years since another Asian American sitcom was tried (Margaret Cho’s All-American Girl, which was cancelled after a single season)? Asian actors appear with growing frequency in the movies and on TV – how do we understand this shift (thinking of John Cho, Kal Penn, Lucy Liu, Margaret Cho, Aziz Ansari, etc.)? I'm cribbing from your day 1 list for my introductions on Tuesday.